When it comes to Pink Floyd covers and 'A Saucerful Of Secrets' then self taught musician Ewan Cunningham is the guy you should be listening to, due to the fact that he not only reproduces the entire Pink Floyd sound perfectly, but he also plays all the instruments on Floyd's second studio album album and also adds all the vocals himself as well. He even wears drummer Nick Mason's iconic butterfly tee shirt to add to the authenticity. Ewan Cunningham is a one man Pink Floyd covers band. But being a talented musician isn't easy, no matter how effortless it can often look. 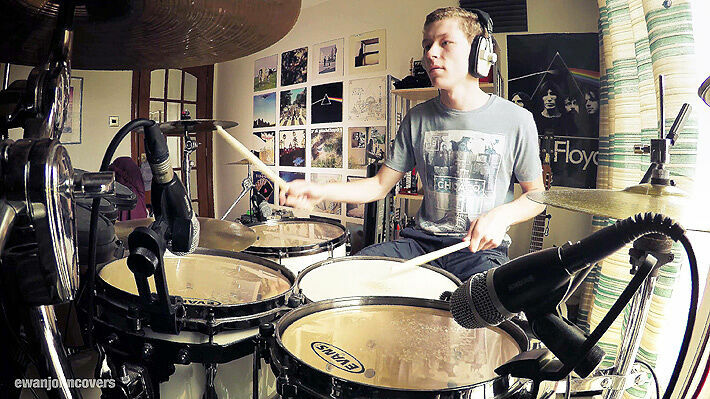 It takes years of dedication and practice, plus plenty of natural talent, which is exactly what Ewan (aka YouTuber Ewan John Covers), hailing from Falkirk in Scotland, has given over to his drumming. 18-year-old Cunningham is a self-taught drummer who started playing the drums when he was only 4-years-old. "On my 4th Christmas, my parents got me a small plastic drum kit." Cunningham tells Smash in an email. "By the end of the day I had smashed it to pieces by playing it too hard. Since my Dad is a guitarist he wanted me to learn a musical instrument so he went out and bought me a proper drum kit this time and from then on I've always played the drums. It just came naturally to me and that brought great enjoyment." He's now built up quite a number of videos on his YouTube page of his drumming covers of rock music, many of them Pink Floyd covers, one of his favorite bands. In the video above Cunningham covers Pink Floyd "A Saucerful Of Secrets," taken from the album with the same name which drummer Nick Mason has said is his favorite Floyd album. Cunningham even wears Mason's famous butterfly tee from his performance in Floyd's Live at Pompeii. Cunningham bought the tee online at redbubble.com and it shows the mark of a true fan. Ewan Cunningham playing drums at his Falkirk home / Image: YouTube. "For me Pink Floyd's music is on a different level from everything else." says Cunningham. "Their albums really speak to me and I relate to a lot of the themes and emotions that they touch on with their music. I also love how unique each album is, they all sound totally different from each other. One song could be a soft melodic ballad, the next could be an epic rock song with screaming guitars and organs that goes on for 20 minutes!" As well as the drums Cunningham has also started learning other instruments including the guitar, bass, keyboards and vocals. He's basically a complete one man Pink Floyd covers band, but Ewan is the first to admit that drumming remains his main passion, and especially the drumming of Pink Floyd's Nick Mason. "People will often look at this type of drumming and look down upon it for being repetitive and easy." Cunningham says about Mason's style. "That's what I love about it though, there's more to it than just cramming in as many drum fills to each song like a lot of drummers do. You have to have the right feel to play these Pink Floyd covers properly and that's the most important thing I have learned from playing the drums. This comes from someone who used to play lots of heavy metal drumming and think it was the best thing I've ever seen. For me now that I'm older, drumming within the music and not over doing it is far more important." Check out a couple more of Cunningham's Pink Floyd covers below. Head to his YouTube page for many more. Pink Floyd Covers "Shine On You Crazy Diamond"
Pink Floyd Covers "The Dark Side Of The Moon"